• Multi-material streamlined design for superior body fit which enables top to worn under jersey. • Lightweight, stretchable mesh main construction with breathable padded inserts. • Strategically placed panels to ensure the vest remains well fitted. • Removable, slim-profiled, lightweight shoulder protectors. • Ergonomic back protector follows natural curve of the back. • Back protector pocket can also house hydration pack. • Front and back conduits for hydration pack hose. • Rear kidney compartments for convenient access. • Full length main front zipper for easy in and out. • Soft chest and side padding is reinforced for added impact absorption and comfort. 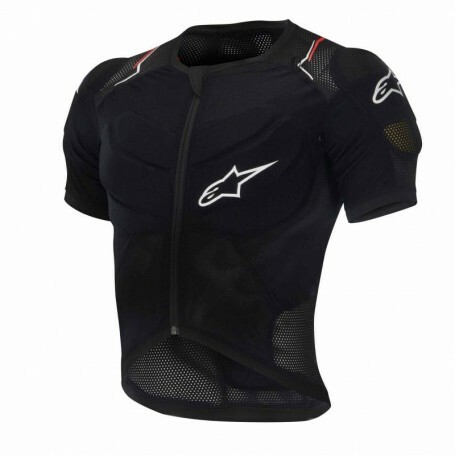 • Short-sleeved styling allows for use with Alpinestars elbow protectors. • BNS compatible.